Testicular cancer develops in one or both of the testicles (testes). Over 90 percent of testicle cancers develop in the germ cell. These cells are responsible for making sperms- male cells that fertilize a female egg cell. 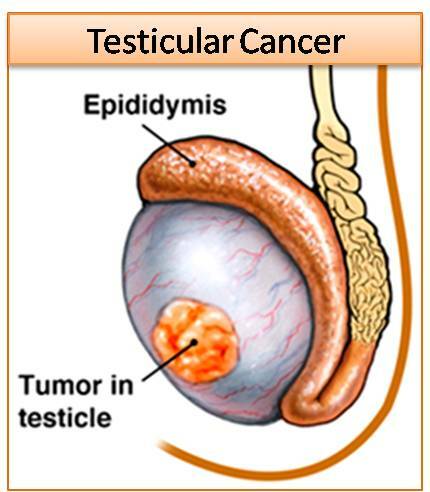 Tumors develop in these cells thus forming a lump or swelling on the testicles. However all lumps in the testicles may not be tumors; plus not every tumor is cancerous- malignant. Testis cancer can spread to other body organs such as the brain, lings, lymph system hence causing serious illnesses. Cancer of the testicles accounts for only 1 percent of all male cancers but it is the most common type of cancer found in men between ages 25 and 35. The incidence is slightly in white than in African Americans and it is rarely seen in middle-aged and older men. The malignancy rate of testicular tumors is 96 percent, but if it is diagnosed early, this type of cancer is highly curable. This is the most common testes cancer. This type is slower in growth but also easy to treat than non-seminomas. This cancer occurs mostly to men in their late 30s and early 50s. This condition happens where malignant tumors grow in the germ cells at their early stage of development. Seminomas can be of different types including classic, anaplastic or spermatocytic. 85% of the cases are usually of the classic type. Anaplastic type is more aggressive and hence more likely to spread to other body organs. Spermatocytic occurs mostly to men that are over 50 years. This type develops slowly and hence the chances of spreading are low. Non-seminomas develop in cells that are specialized and more mature than germ cells. Non-seminomas occurs to men in their mid- 30s. The rate of aggressiveness of this condition varies: aggressive tumors (embryonal carcinomas) are 20 to 25 percent. 25-30% of the tumors called teratoma carcinomas are also aggressive. Perform the self exam once a month. select an easy day to remember such as the first day of the month. Learn how your testicle feels normally so that it will be easier to identify changes. A normal testicle should feel oval, smooth, and uniformly firm, like a hard boiled egg. Perform TSE following a warm shower or bath, when the scrotum is relaxed. Gently roll each testicle between your thumb and the first three fingers until you have felt the entire surface. Pay particular attention to any lumps, change in size or texture, pain, or a dragging or heavy sensation since your last self exam. Do not confuse the epididymis at the rear of the testis with abnormality. Bring any changes to the attention of your physician. A change does not necessarily indicate a malignancy; only a doctor can determine that. The incidence of testis cancer is quite high in males born with an undescended testicle. Therefore, this condition should be corrected early in life. Parents of infant males need to make sure that the child is checked by a physician to ensure that the testis have descended to scrotum. Testicular self- examination (TSE) once a month following a warm bath or shower (when the scrota skin relaxed) is recommended. Early diagnosis of testis cancer is essential because this type of cancer spread rapidly to other part of the body. Because in most cases no early symptoms or pain are associated with testis cancer, most people do not see a physician for months after discovering a lump or a slightly enlarged testis. Unfortunately this delay allows almost 90 percent of testicular cancer to metastasize (spread) before a diagnosis is made.